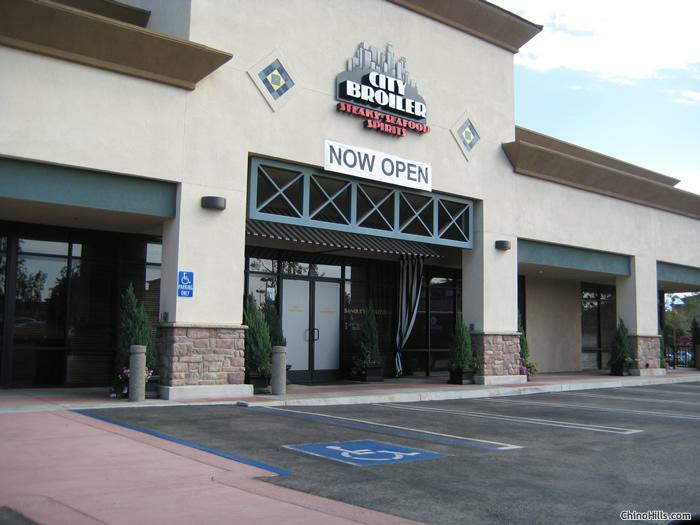 Sitting at the edge of the Crossroads Marketplace at Chino Hills is the City Broiler, which specializes in steaks, seafood and spirits. The locale isn’t much to speak of, being surrounded by corporate retail outlets like Best Buy, Bed, Bath & Beyond and sundry fastfood joints. The interior, however, does a fine job of transporting you away from images of parking lots and shopping carts. As a nice touch, the front door windows are frosted to really convey the feeling of being in this dining sanctuary without making you feel trapped, like in a casino. The layout of the City Broiler is fairly straightforward. The host desk partitions off the dining area behind it while the left and right wings serve as routes to the kitchen and the full bar, respectively. Both areas have glass panels installed to section them off and are surprisingly efficient at dampening sound. A sports game was on the television above the bar and it never distracted me once. The decor feels east coast, with exposed brick walls and green carpeting. Black and white posters of celebrities shooting pool dot the walls. In fact, with the proper lighting, a pool table or maybe a card game or two would be right at home in this environment. The lighting, I think, was the weak link in the design. It will rain down on you like a supernova, casting horribly unflattering shadows everywhere. That bit aside, the atmosphere is quite pleasant. Tables are draped in linen. A wine list is ready at the table and the waitstaff are presentable and easy on the eyes. This is an excellent place to take your family. The menu is reasonably priced at the low 30’s on the high end. There’s also a fair selection of seafood and land options, including sandwiches for both lunch and dinner. It’ll be very hard for the average diner not to find something that looks good on the menu or something filling, especially when most selections come with your choice of two sides. The taste, however, leaves everything to be desired. Secondly, a coworker of mine recommended the City Broiler as having the “best calamari.” Since I’m partial to calamari, I had to order the appetizer ($9). This calamari is complex, so let me break it down in stages. First, it’s served on a red tortilla shell accompanied by marinara and a mango-papaya salsa in separate dipping ramekins. The squid is sectioned into rings and fried with a tangy breading. The calamari is well-cooked and the spices in the breading are pitch-perfect and will have your mouth watering with each bite. Had they stopped there, I would have been very happy. Unfortunately, someone decided that grated cheese would be a wonderful complement to squid. Then as the coup de grace, they decided to slather on some ranch dressing on top. I imagine that the chef who created these dishes actually hates seafood. In fact, this is the kind of seafood that people who don’t like seafood would eat. They’ll pile on the most garish flavors to disguise the seafood taste. The soup wasn’t any better. I ordered a bowl of New England clam chowder ($5) and while it looked fine, it tasted like two cans of Campbell’s soup were poured into a large bowl and microwaved. Since whoever bought the cans neglected to buy the chunky kind, the kitchen staff cut up several stalks of celery and stirred them in to keep the one clam in the soup company. The entrées were on par with the first two courses. My companion ordered the Macadamia Nut Crusted Mahi Mahi ($21) topped with mango relish. It looks good on paper, but that seafood-hating kitchen staff went crazy with the “crust” part and buried the fish under half an inch of breading. It might as well have been a slab of macadamia nut bread. My dish failed just as spectacularly. I ordered the Bermuda Triangle ($28) and like the ships that suffer its namesake, the flavor was lost at sea. This plate consists of a small lobster tail, three shrimp and three scallops accompanied by melted butter and cocktail sauce. The lobster and the shrimp were barely passable, but the scallops were prepared by someone who hates the world. I couldn’t bring myself to finish them. Since I’m a completionist at heart, I forced myself to order dessert, hoping the creme brulée would take the sting out of the dining experience. No such luck. Even dessert was horrible. Apparently, the City Broiler prepares their creme brulée to completion, caramelized sugar and all, and then chucks it into the refrigerator until someone orders it. When someone does, the restaurant serves it as is with the addition of berries and fresh powdered sugar. It’s really weird to eat stiff, cold creme brulée. The City Broiler is really an oddity. It’s corporate chain restaurant food priced at California casual prices dressed in family restaurant ambiance. Unless you’re one of those people who hate seafood, but want the health benefits, stay away.